These two species are similar in habits to Agriotes lineatus (p. 132). Although both are also widely distributed, A. obscurus is most abundant in northerly districts, especially on lighter soils with a high organic content; A. sputator has a more southerly distribution. 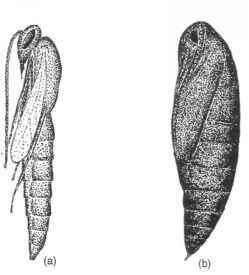 Adults of A. obscurus are 7-10 mm long and uniformly dark brown, with a relatively large, densely punctured pronotum; those of A. sputator are 6-7 mm long and mainly reddish-brown, with the pro-notum somewhat darker and relatively shiny. Larvae of all three species are very similar in appearance.